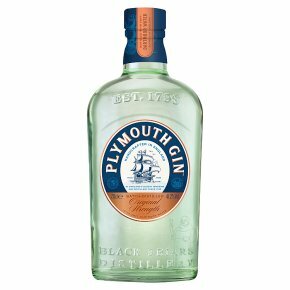 Unlike London Dry gin, made all over the world, Plymouth gin is distilled only within the ancient walls of the city. Its distinctive taste is created by carefully balanced juniper and the avoidance of too many bitter botanicals, and using crystal-clear water from the nearby granite hills of Dartmoor. Plymouth Gin Original has been distilled using the same blend of seven exotic botanicals, soft Dartmoor water and pure grain alcohol since 1793 The Nose: A rich, fresh aroma of juniper followed by notes of coriander and cardamom The Palate: Extremely smooth, creamy and full-bodied, with a slight sweetness The Finish: Elegant, long, fresh and aromatic For a fruity Gin and Tonic, serve 50ml of Plymouth Gin with Indian Tonic over cubed ice in a hi-ball glass and garnish with Orange Peel and Coriander. The award winning Plymouth gin is ideal served with tonic over ice and a squeeze of lemon or lime. Alternatively savour its smooth taste in, amongst other wonderful cocktails.